If I had to pick one player out of the pantheon of jazz guitarists who was the most creative, spontaneous and dynamic, the clear choice for me would be Lenny Breau. Although his life was cut short by an untimely death, and his history was peppered with personal difficulties and drug problems, he achieved great artistic heights with jazz guitar, and his innovative approaches to the instrument have influenced countless guitarists since. In this post, you’re going to learn some of Lenny Breau’s key approaches to chord melody jazz guitar, as well as get a background of his life and influences. Born in 1941 in Maine, USA, Lenny’s parents were Harold “Hal Lone Pine” Breau and Betty Cody: professional country and western musicians. After starting playing guitar at age 8, Lenny ended up being the lead guitarist for his parent’s band at the age of 14. Around 1959, Lenny left the band after his father chastised him for using jazz lines in his lead playing – and actually slapped him in the face for it! This event shaped Lenny’s destiny, as he then went to seek out local jazz musicians to collaborate with instead. Lenny ended up being a regular session guitarist for CBC radio and CBC television and even ended up having his own TV show, The Lenny Breau Show. Lenny Breau’s later career was mainly spent performing, teaching, and writing for Guitar Player magazine. Lenny died in 1984, aged only 43, but left a huge legacy that should be studied in detail by all jazz guitarists. Blending many styles of music such as jazz, country, classical, Indian, and flamenco guitar, Lenny had a highly evolved fingerstyle technique that reached rare levels of virtuosity. As you can hear, Lenny’s playing is totally different to any other jazz guitarist you may have heard. You might be fooled into thinking there are two guitarists onstage, instead of one. Lenny wanted the guitar to sound like a piano, with a pianistic ‘left-hand’ style comping and ‘right hand’ melodies. This resulted in an entirely new approach to playing chord melody. If jazz guitar was a martial art, Lenny Breau would have been a true kung fu master. Lenny is completely spontaneous and uninhibited in his soloing – you can tell that very little of his improvisations are premeditated in any way. Lenny responded dynamically to whatever his other band members were playing at the time. This is what I like most about Lenny Breau. He encapsulated the jazz ideal: spontaneous, original, and energetic musical expression in the present moment. This is what we are all aiming to get to of course, but few truly make it there. Lenny proved that it can be done. As mentioned above, Lenny approached chord melody jazz guitar as if he was playing a piano, with the ‘left-hand’ (lower register) comping and the ‘right-hand’ (higher register) featuring elaborate melodic lines. Not an easy feat, but Lenny developed clever approaches to get this effect, which the following licks demonstrate. Notice the types of chords that Lenny is playing in the lower registers throughout this lick. As they are only 2 notes (usually the 3rd and 7th of the given harmony), it enables him to be very melodic with elaborate single line phrases in the upper voice. Because of this clever three note voicing technique (i.e. 2 notes in the comping and 1 note in the melody), it freed up Lenny’s hand to play much more melodically than if it was being ‘strapped down’ by holding down too many notes (e.g. if he were to use drop 2 or drop 3 voicings instead). Also noteworthy is some hip sounding offbeat comping in the lower register. Trust me, it’s a lot easier to play than it sounds. The 2nd bar features classic bebop vocabulary: a C#dim7 arpeggio (which is a 3 to 9 arpeggio of A7b9), followed by an A altered scale which creates tension in the melodic line. 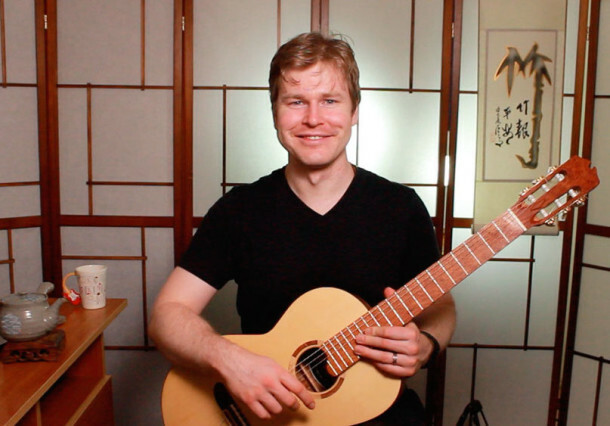 Here’s another example of a similar approach with three note voicings. This is followed by an elaborate single line that uses a 43241 bebop finger pattern in bar 2. One of Lenny’s hallmark techniques was being able to hold long notes in the melody line while comping with offbeat figures in the lower register, giving the illusion of playing two guitars at once. You can see this in action in bars 1 and 3. To beef up a single line, Lenny Breau would often comp with three note voicings on every melody note, as this final lick demonstrates. This is another textural effect you can add to your chord melody toolkit. Also, note how the chords are anticipated on the offbeat to bars 2 and 3 (labelled ‘Ant’ in the notation). Chord anticipation is a technique that was one of Lenny’s favorites – as it, in his own words, “gets the music to swing more”. Lenny Breau left a large legacy of recordings; unfortunately, they are of varying quality. To get more on the life and background of Lenny Breau, check out the book One Long Tune: The Life And Music Of Lenny Breau by Ron Forbes-Roberts. Lenny Breau’s chord melody techniques are excellent to study for chord melody beginners. They are relatively easy on the fretting hand yet still sound very effective. That means that you can get started right away arranging swinging chord melodies that sound great. To learn Lenny’s techniques in more detail as well is some other easy arranging techniques, check out this guest post I did recently for Jazz Guitar Online, Chord Melody Made Easy. I hope this article has inspired you to check out more about Lenny Breau’s legacy. Lenny was an astoundingly creative guitarist and an inspiring musician, despite the many challenges he faced in his personal life. Studying his recordings has made a huge impact on my own playing, so I encourage you to do the same. Don’t forget, my new eBook, The Complete Guide To Chord Melody And Chord Soloing, has just been released! 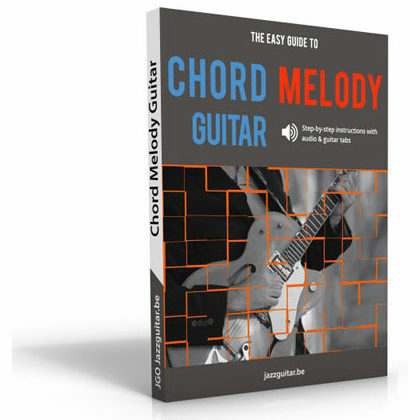 If you want to learn the easy way to chord melody mastery, get your copy by clicking here. In the next and final installment of this 4 part series on great chord melody players, you’re going to learn about perhaps the most famous jazz guitar chord melody player that ever lived. He certainly needs no introduction. Do you know who I’m talking about? I guessed right. He is an incredible player and fits your leanings towards players eclectic styles. Cannot pretend to be anywhere near the level required to master jazz guitar but I really appreciate how much easier it gets with the stuff you guys put together. Many Thanks.